On Feb. 5, the school board had their third meeting of the year, where they focused on the public concerns about LGBTQ students, the potential voting area maps and held a discussion on the updates of Operation and Management. The first notable event was that the majority of the public comments during the meeting focused on LGBTQ support within the district. Most referenced Oak Park school district’s recent decision to provide LGBTQ cultural competency training for teachers, administration and staff members. The public discussed their own experiences while addressing the board. John Cummings, a parent of a transgender student at Westlake High School, emphasized the importance of promoting inclusivity within the Conejo Valley school district. 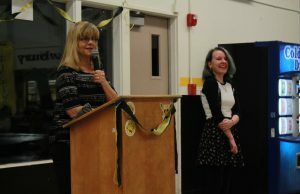 Amy Catalino, Mary Anne Van Zuyle and Skyler Casino, a representative of Conejo Valley Pride, all voiced their desire for greater support for LGBTQ students. The public suggested that a training program similar to that in Oak Park be implemented in CVUSD. Casino asserted that training had the potential to improve students’ test scores and relationships with staff members. Others echoed that sentiment. 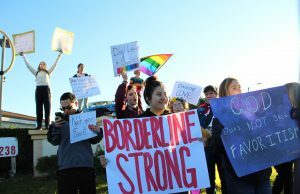 “It’s important for young people in our schools to know that adults accept them for who they are,” Van Zuyle said. The next notable event was with Jonathan Salt and Larry Ferchaw, the creators of the potential new voting area map options. They explained the goals that each map was accounting for to the school board. They gave an overview of the maps of scenario 2A, 3A and 3B. The public was then allowed to voice their concerns about all the maps that were presented. Some stated that they were concerned since they are using a census from 2010, some were concerned with locating the maps especially pertaining to the concentrated Hispanic areas or even the maps reviewed during the closed session. After this the school board got to ask Salt and Ferchaw questions to clear up these concerns. Finally, Salt responded that other maps could potentially be added to Everett’s inquiry. This illustrates that there can be more options than the six that have already been presented, most likely during closed session. Next week, there will be a resolution to possibly choose one of the maps. Finally, the board referenced updates in the Operation and Management, as new members had recently been added to the board. Much had been accomplished last year, such as cleanup of the high schools and additions of classrooms. The board also invested in standardizing locks for emergency accessibility, replacing old and broken equipment and holding private contractors accountable. They also brought up some remaining challenges, mainly the two underutilized spaces due to lack of parking space. Discussion with the stakeholders is continuing in order to find a solution. Over $12 million has been spent on facilities and moving them around, yet still more work needs to done.